NOT ELIGIBLE FOR FAUX FUR POM BUNDLES. Light grey with cream and pinkish tones. THESE ARE THE LAST THAT I WILL BE CARRYING AS FABRIC IS DISCONTINUED. 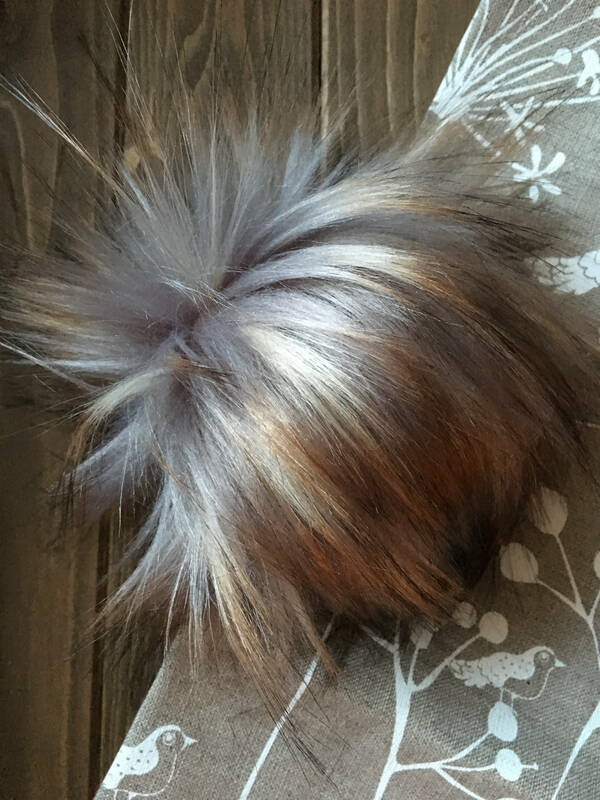 Super soft and fluffy faux fur pom. Handmade and sewn by me. Made from 100% polyester. Comes with sturdy cotton/nylon ties to attach it to your work. Made in a pet-free, smoke-free environment. Please be sure of your selection. I don't accept refunds or exchanges on my faux fur poms. IF YOU LIVE IN THE OTTAWA AREA AND WANT TO ARRANGE FOR A PICK-UP, PLEASE USE COUPON CODE PICKUPIN613 AT CHECKOUT. PLEASE DM ME TO MAKE ARRANGEMENTS FOR PICKUP. PLEASE NOTE I LIVE AND WORK IN THE WEST END OF OTTAWA. All poms are traced with the same size template and are filled with the same amount of polyfill by weight. Due to the variations in pile density and thickness of the backing, the poms can range in their size slightly. Sizes are approximate.